About the only thing we love more than writing and getting published, is having our students make it into print. Singing–Body and Soul is for the young singer, to help you discover how your voice, body and mind work together. The voice has the most exciting sound when a singer is between 20 to 25 years old, when "desire" starts to ride on the sound, and helps you stand out at an audition. By then, you already need years of singing experience in order to make the most of your opportunities. That means learning about your voice early–at 14 years old or younger. Singing–Body and Soul offers new guidance for developing your singing, including artistic and scientific descriptions, and song lyrics to illustrate states of mind. More storytelling than classroom lecture, with quotes and references from Charlie Brown, Albert Einstein, and Dr. Seuss, Singing–Body and Soul can help you understand your voice in new ways. "I almost canceled out of the October 2008 NYWW, opting to stay home, clutching my available cash. I went anyway – it was my best decision that year. Richard Goodman helped me rework the target audience of my book Singing – Body and Soul from adults to teens - by pulling out of me the fact that singers need the most help from ages 11 to 25 – when their voices are changing. With a rewritten snappy, sarcastic style, the new text is now drawing the attention of high-level music professionals." From the author of Revenge Wears Prada, a delightfully dishy novel about the all-time most impossible boss in the history of impossible bosses. The Devil Wears Prada gives a rich and hilarious new meaning to complaints about “The Boss from Hell.” Andrea Sachs, a small-town girl fresh out of college, lands "the job a million girls would die for" when she's hired as the assistant to Miranda Priestly, the high-profile, fabulously successful editor of Runway magazine. Narrated in Andrea’s smart, refreshingly disarming voice, it traces a deep, dark, devilish view of life at the top only hinted at in gossip columns and over Cosmopolitans at the trendiest cocktail parties. From sending the latest, not-yet-in-stores Harry Potter to Miranda’s children in Paris by private jet, to serving lattes to Miranda at precisely the piping hot temperature she prefers, Andrea is sorely tested each and every day—and often late into the night. She puts up with it all by keeping her eyes on the prize: a recommendation from Miranda that will get Andrea a top job at any magazine of her choosing. As things escalate from the merely unacceptable to the downright outrageous, however, Andrea begins to realize that the job a million girls would die for may just kill her. And even if she survives, she has to decide whether or not the job is worth the price of her soul. Once there was a little girl from Fargo, North Dakota, named Maggie Goldfarb, who grew up, moved to Manhattan, and morphed into Magnolia Gold, the highly paid editor-in-chief of Lady magazine, with a corner office, a designer wardrobe, and dozens of loyal employees. Then one day, Magnolia is ignominiously replaced by Bebe Blake, a brash television personality who remakes the magazine in her own hilariously inappropriate image. With her ketchup-red hair, skintight clothes, and penchant for boy-toys, Bebe is more out of control than a speeding limo. Shunted off to a back office, Magnolia seethes from the sidelines as Bebe turns her beloved, once-profitable Lady into a sideshow. As things go from bad to worse, Magnolia fears that her career will never recover, but even she can't predict how deeply satisfying her eventual triumph will be. Inspired by real-life events, Little Pink Slips is a novel about corporate shenanigans at their most flagrant, behind-the-scenes details of the media business in all its malfeasant glory, and one woman's fall, rise and sweet revenge against it all: delicious, can't-stop-reading fun. She had every girl's dream: the perfect marriage to the perfect guy in the perfect apartment on the Upper East Side. Marriage fit Stephanie Klein like a glove . . . but unfortunately it fit her husband like a noose. Celebrated bloggist, photographer, and freelance writer Stephanie Klein lets it all hang out in this juicy tell-all tracing her jump back into single life following her divorce. On the dating advice of her therapist, Klein attempts to keep "a pair and a spare" of men always on hand and has lots of bawdy fun along the way. But when the anniversary of the devastating breakup from her "wasband" forces her to revisit what happened, she finds herself wanting more than her therapist's recommended gimmick to keep her emotionally safe. Straight Up and Dirty demonstrates that the true measure of success isn't what's crossed off life's to-do list. It's having the grace and fortitude to move through change, curls intact and smiling. On the morning of May 25, 1979, six-year-old Etan Patz left his apartment to go to his school bus stop. It was the first time he walked the two short blocks on his own. But he never made it to school that day. He vanished somewhere between his home and the bus stop, and was never seen again. The search for Etan quickly consumed the downtown Manhattan neighborhood where his family lived. Soon afterward, "Missing" posters with Etan's smiling face blanketed the city, followed by media coverage that turned Etan's disappearance into a national story–one that would change our cultural landscape forever. "The NYWW Perfect Pitch Conference fueled the final leg of my journey to my first book deal. Dropped into a roomful of aspiring authors nearing the finish line made for a high octane weekend. You couldn’t help but learn new tricks. Bonus: The pre-Conference homework focused me tightly enough to rename my book baby, Stinking Rich." "At the New York Writers Workshop successful authors and agents taught me how to pitch my book, how to find an agent, and how to talk to editors. Then I got to meet three editors, two of whom asked to see my manuscript. For me, this conference was a game changer. Don't look for an agent without this kind of expert help." Jessica Alexander, author of Chasing Chaos: My Decade In and Out of Humanitarian Aid, published by Broadway Books (October 2013). Mark Goldblatt, author of Twerp, published by Random House Books for Young Readers (May 2013). Rashad Harrison, author of Our Man in the Dark (Atria/Simon & Schuster, November 2011). "Working with the fabulous super-star editor and author Sally Koslow has been a dream come true! I would have NEVER landed a book deal without the workshop in general and Sally in particular. Sally lent me her expertise, talent and insider knowledge of the publishing world in my relentless pursuit of realizing my potential as a published author." 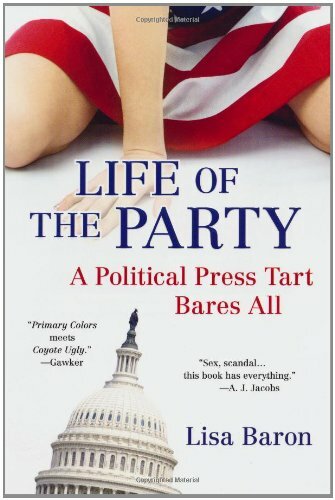 Lisa Baron, whose book, Life of the Party: A Political Press Tart Bares All, was published by Citadel in June 2011. "My novel, Act of Grace, will be published thanks in part to your excellent advice both in the individual consultation you provided (some of the best money I ever spent) and from doing the pitch sessions in New York." Karen Simpson, from note to Tim Tomlinson, leader of her Fiction Pitch Conference group. The book was published in March 2011 by Plenary Publishing. "The Non-Fiction Pitch Conference was an invaluable experience. It provided me with the tools and support I needed to get published. I can’t thank the folks who put it together enough." John Monahan, whose book, They Called Me Mad: Genius, Madness, and the Scientists Who Pushed the Outer Limits of Knowledge, was presented at the New York Writers Workshop Non-Fiction Pitch Conference and, as a result, was published by Berkley Books in December 2010. "I had a good idea for a book on juvenile justice and a ready-made platform, but my proposal lacked focus and clarity. Richard Goodman’s keen analysis and the suggestions of the fine students in the class sharpened my thoughts. I sold the proposal to Kaplan Publishing Company for a nice advance." Judge Irene Sullivan, whose book, Raised by the Courts: One Judge’s Insight into Juvenile Justice, was published by Kaplan Publishing in November 2010.